There was a time when Matt McLean stood amid orange trees off Highway 27 and saw gold. Citrus was king in Lake County, and a soaring observation tower offered panoramic views of green groves blanketing an undulating central Florida landscape. It was hard to imagine then that orange juice, an American staple as beloved as peanut butter, could one day fade from breakfast tables. But now an entire industry lies in peril. 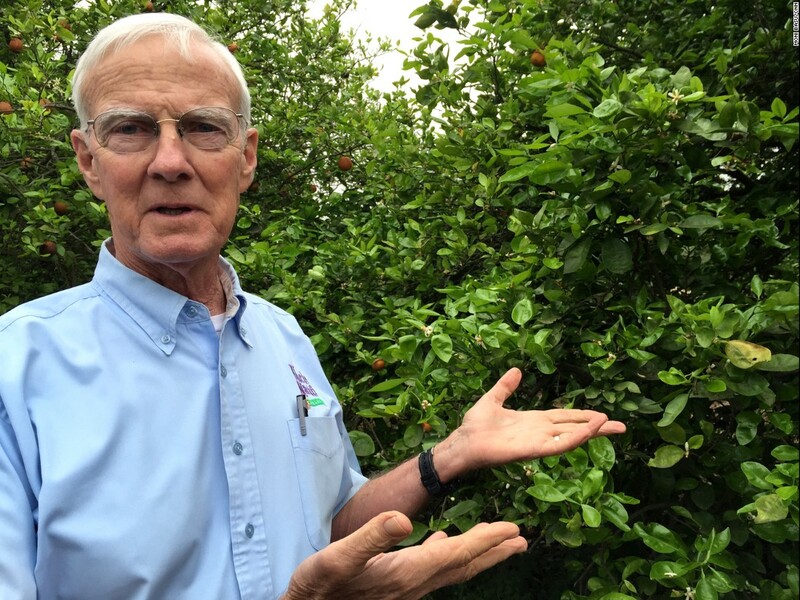 And McLean, the son and grandson of Florida citrus growers, sees his livelihood in jeopardy. On this muggy morning, McLean picks up a tired Valencia orange, fallen to the ground before its time. It got that way after a tiny brown bug landed on a leaf and unleashed a bacterial disease that incubated in the tree's roots, festered in its trunk and eventually cut off the flow of nutrients. The starved tree is stunted, the leaves yellow and blotchy. Its oranges are juiceless and sour, and many lie rotting on the ground. The bug, an Asian citrus psyllid, was carrying citrus greening disease, otherwise known by its Chinese name, huanglongbing. The disease was first detected in Florida in 2005 and spread cancerlike. Fast. Furious. Fatal. Great American Stories is an occasional series on the unexpected places and unforgettable characters that help define the country. "We are seeing the death of an industry in front of our eyes," McLean says, scanning his groves. "These trees will not survive." Worst of all, there is little McLean can do to save his crop. Despite millions of dollars spent on research and hundreds of scientists working at a frenzied pace, no cure or prevention has yet been developed for citrus greening disease. "We have survived a lot of things," McLean says, recalling deep freezes and other diseases like citrus canker that have wiped out thousands of trees. "But today, citrus greening has affected the entire state. We just don't know what will happen." He finds a Temple orange that is not infected and slices it open to taste. Its genetics and history may offer a clue for the future of Florida's oranges. So might organic practices that McLean has embraced, he says. McLean is not alone in his quest; researchers across the nation are using genetic material to figure out how to save American citrus. Others are busy preserving plant cuttings in a tundralike, tornado-proof vault in Colorado that could rebuild the nation's citrus groves if disease does indeed wipe them out. Florida still produces 59% of America's oranges. McLean talks about how the once-thriving $10 billion industry provided nutrition for consumers and jobs to so many people. He recalls the TV ads in the 1970s with former beauty queen Anita Bryant: "Breakfast without orange juice is like a day without sunshine." McLean fears dark days are approaching. His father's groves were wiped out once by Mother Nature, but this time it's different. With citrus greening, it's hard to see a future in citrus. "We have to live by faith and not fear," he says. "But OJ, as you know it, may not exist anymore." Matt McLean was pulled back into the family business by the prospect of growing organic oranges. As a boy, McLean ran up and down Sugarloaf Mountain Road, through rows and rows of sun-kissed citrus trees. He grew up in a house his father, Benny McLean, bought the year before Matt was born. Ever since he can remember, he worked in the groves, spending sultry summer days planting young trees, yanking weeds and picking fruit. By the time he graduated from high school, he'd had enough. He hailed from four generations of orange growers, but McLean told his father he wasn't going to study agriculture in college. He hated it. McLean went off to the University of Florida and studied business administration, fully intending to start a career that would take him far from the groves. But when he returned home in 1993 to begin searching for a job, he got involved again with the family business. Orange juice, he discovered, was in his blood. By then, though, Lake County was no longer a citrus superpower. A series of disastrous freezes in the 1980s had decimated crops. McLean's father and grandfather once owned 500 acres of citrus, but when the temperature plunged to 17 degrees one Christmas Eve, they lost almost everything. The younger McLean began working for a juice brokerage. After a German client inquired about organic juice -- this was 1999, long before Whole Foods made organic fashionable -- McLean delved into growing citrus the natural way. He returned to methods his grandfather used before the 1960s, when American farmers began liberally applying pesticides and synthetic fertilizers. McLean went back to his father's house that still sat off a dirt road on a hill and started with five acres. He eventually grew his business to managing more than 1,500 acres of citrus. He speaks with pride about the organic citrus he grows. "They're good for you and good for the planet," he says. He thought he was continuing family traditions, that his children and their children would also earn their living off oranges and grapefruit. But now he's been forced to try other things. There's a field of green beans next to avocados, pomegranates and blackberries planted where an orange grove once stood. And a grove of Valencias now shares land with thriving peach trees. "We're trying to come up with alternatives," McLean says. "You'd be surprised what you do when you get hungry," adds his father. "We have to keep the cash flowing." Matt's brother Ben has a master's degree in fruit crops and has been working furiously with industry colleagues, scientists and the government to find a way to stop citrus greening's spread. 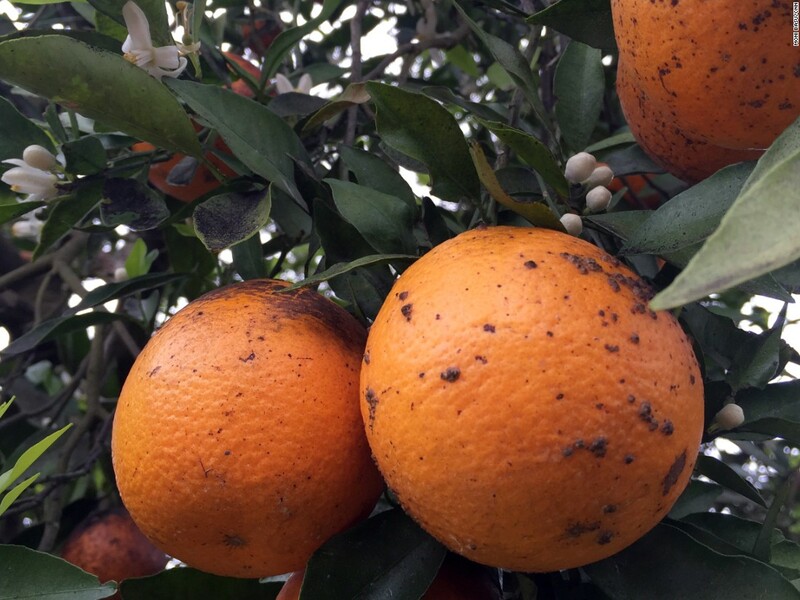 The disease flared west from Florida to Texas and it has now been found in groves in California, America's second largest citrus producer. Scientists are developing bactericides and experimenting with tree treatments like heat therapy, says Michael Rogers, interim director of the University of Florida's Citrus Research and Education Center. They are also breeding citrus that are tolerant to disease. About seven years ago, when citrus greening was starting its spread, a handful of Florida growers planted a new variety, LB8-9, as an experiment. Those trees are all infected now, but the amazing thing is they are still able to produce fruit, says Fred Gmitter, a citrus breeder and geneticist who works with Rogers. "It's what trees used to look like before greening," says Gmitter of the variety trademarked as Sugarbelle. "We don't really have answers as to why these trees are so tolerant." Scientists also have been looking into why certain rootstocks stayed healthier than others. Back in citrus' heyday, a new rootstock would not be released without decades of research and trials. But now, Gmitter says, any rootstock that shows promise is in high demand. Some growers are considering using genetically modified strains of citrus, even though such artificial alterations remain highly controversial. McLean won't go there. He remains resolute on finding a way to stop greening and is focusing on organic cures. He has tried botanical oils like neem. And every 21 days, he releases thousands of parasitic wasps that lay eggs inside young Asian citrus psyllids, or nymphs. The eggs hatch and devour the nymphs' insides. The wasps can never eradicate citrus greening disease, but McLean says they provide some amount of control and management. The successes are modest compared to the rate at which citrus greening is killing McLean's trees. Lately, McLean has had new reason to hope. The answer, he says, may be lurking in one of his grandfather's old orange groves. Benny McLean is proud of his family's 1944 orange grove, which has withstood freezes and citrus greening. When McLean announced he was going to start an organic business, his father chuckled. "I graduated from UF in 1965. No one even knew how to spell herbicide then," Benny McLean laughs. Father and son walk through one of their oldest orange groves, planted in 1944 on the southeast corner of a lake, which helped protect the trees through frigid winters. They are Temple oranges grown on Cleopatra Mandarin rootstock, known to thrive in Florida's sandy soil. The trees are lush with flavorful fruit. "It's amazing that these trees have been here all these years," Benny McLean says. "You are looking at old genetic material. And this is all about the DNA and genetics. Old trees show a lot of resistance. Newer trees show high levels of susceptibility." 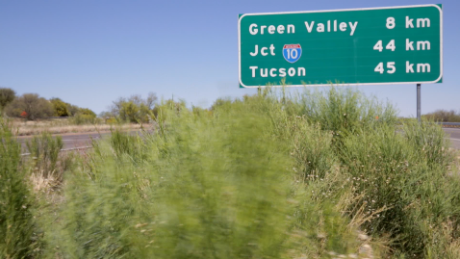 The older McLean has a theory about why not a single tree in this 2,000-strong grove has been infected with citrus greening disease even though across the highway, every tree is ailing. He says this particular grove was not sprayed with chemicals until it was 25 years old and had already developed a strong immune system. Newer groves are exposed from a young age to all sorts of poisons that may compromise their immune systems. "Why is it that the psyllid is attracted to an orange tree and not an oak?" McLean asks. He explains that psyllids are always hunting for amino acids to break down into protein. And when orange trees are fertilized the conventional way with ammonium nitrate, the levels of amino acids skyrocket. They are like pest candy. Maybe that's one reason the 1944 grove is disease-free. Gmitter, the citrus breeder, says there might be more to it than that. Temple oranges are a more tolerant variety, as is Cleopatra rootstock, he says. And there might be other organisms present that are part of the equation. "I can't tell you why that grove is healthy," Gmitter says. "I do know that in other parts of the world where growers are less dependent on chemicals, greening has not been as bad." Matt McLean says he has applied for a grant to investigate methods of classical breeding and natural resistance. He also wants to study the rootstock and scion, or young shoots, in this untainted grove. He thinks such genetic research could lead to disease-resistant strains of citrus. "That is what could save us." America's war on citrus greening takes place on a vast battlefield. Think of growers like McLean as infantry on the front lines, fighting for the lives of his oranges every day. Thousands of miles away in Fort Collins, Colorado, is McLean's support battalion, the genetic experts at the National Center for Genetic Resources Preservation. The center, often called the Fort Knox of the genetic world, looks like another nondescript building on the Colorado State University campus, but it's designed to withstand fierce tornadoes and terrorist attacks and houses the largest repository of plant and animal genetic material in the world. It's a quiet, mazelike place teeming with white-jacketed scientists and lab technicians who spend hours meticulously preserving genetic material stored in a vast vault that's so cold Gore-Tex snow parkas hang on hooks outside the door for employees. In all, the gene bank has samples from more than 25,000 animals and 350,000 plants, according to Christina Walters, the plant research supervisor. The total number of seeds are in the billions. But with citrus, things are more complicated than planting seeds. A Valencia orange seed is not going to grow another Valencia orange. "This is because the progeny from a tree is not the same as the tree," Walters says. "Just like our children are not identical to their parents -- thank goodness!" 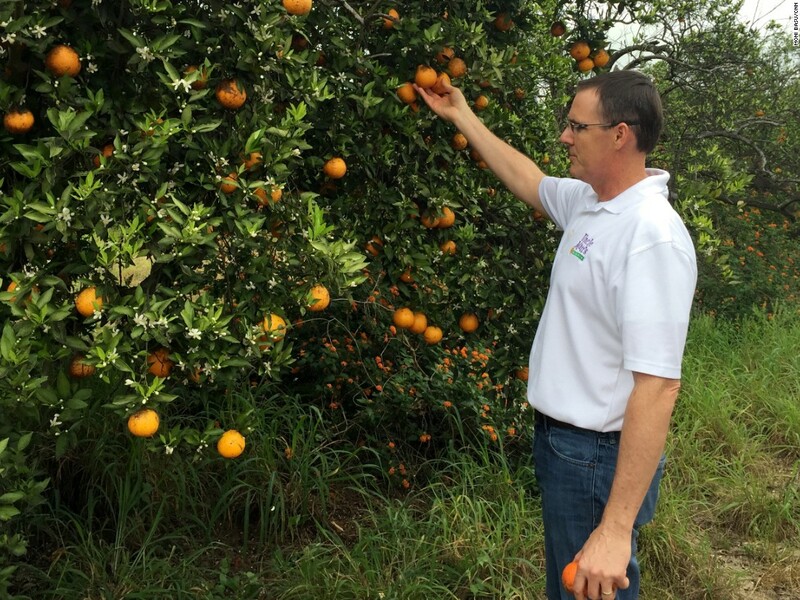 Florida still produces 59% of America's oranges, but citrus greening has cost the state $7.8 billion. That's why Walters' staff preserves citrus through shoot tips, or cuttings of the tiniest tip of the plant. Plant physiologist Gayle Volk uses cryopreservation to keep shoot tips frozen in liquid nitrogen, the only way to preserve them in a nongrowing state and protected from pests and disease. The shoot tips can later be thawed and grafted onto rootstocks to grow new citrus trees. "My research is about finding ways to conserve materials before they are lost forever," Volk says. "We never know what the next disease or climate change will do to our crops. What we are doing is ensuring the future of our food security." If citrus greening does wipe out America's oranges and grapefruit, Volk's research could help reconstitute it. Gmitter calls the Colorado seed bank "survival strategy." It's sort of a Noah's Ark: making sure nature is preserved in case of disaster. This year, the Sunshine State should have profited from a bumper crop of citrus. Florida saw moderate temperatures and lots of rainfall, perfect for lush groves. Instead, Florida is looking at its smallest orange crop on record. The projections are for 100 million boxes of citrus, down from 240 million a decade ago. "For the first time ever, we've had to import juice for production because we did not have enough," McLean says. That in turn is leading to higher prices for orange juice. And McLean's products often lose out to stiff competition on grocery shelves, whether from apple or grape juice or from newfangled drinks like coconut water, especially as health-conscious consumers look for ways to cut sugar and calories. A recent University of Florida analysis concluded the economic toll of citrus greening on the state amounted to $7.8 billion from 2006 to 2014. "I think we are literally closing in on a 100% infection rate," McLean says. "This used to be fun, but it's not fun anymore." Congress has approved $125 million over five years to speed up research on citrus greening. Scientists are racing against time to figure out ways to kill the disease and make trees more resistant. But most American consumers are oblivious to the grave threat to citrus. Perhaps they can't imagine a day without orange juice. Or maybe they've grown weary from hearing about the woes of growers. "The canker, the freezes and now citrus greening has led to citrus fatigue -- kind of like war fatigue," McLean says. "But season after season of greening wears on your psyche." He got into the organic juice business all those years ago because of his passion for healthy living and his family's history of growing citrus in Florida. The passion, he still possesses. But unless science comes to the rescue, the history could end with him. Only three nations do not use the metric system today: Myanmar, Liberia and the United States. But calling America a nonmetric nation is somewhat of a misnomer. Iowa City has gone global. 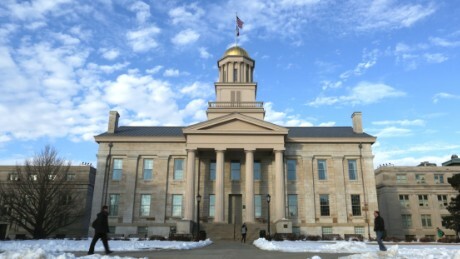 Bubble tea shops outnumber Starbucks 3 to 1, and nearly 1 in 10 students at the University of Iowa hails from China.